Duration: Annual Nativity: Native Lifeform: Subshrub General: Erect, ascending annual 20-60 cm tall with puberulent to glabrate stems and glabrous or glabrate leaflets, stipules linear or filiform, 4-6 mm long, caducous. 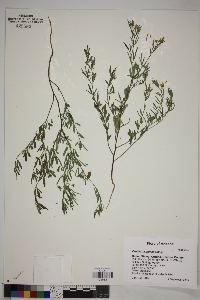 Leaves: Petioles 2.5 cm long or less, leaflets 3, narrowly elliptic to linear-oblanceolate, 3-15 mm wide to 6 cm long, bright green and glabrous above, slightly glaucous and appressed-puberulent beneath. 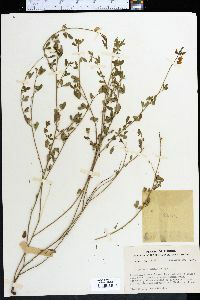 Flowers: Racemes to 30 cm long, many flowered; calyx 3-4 mm long, lobes triangular, equaling tube, petals 10 mm long, bright yellow, keel and sometimes banner faintly washed with red and drying reddish to purple; acumen of keel slender, 7-8 m long, conspicuously exserted beyond wings. Fruits: Pods oboid or broadly rounded-oblong, 6-9 mm in diameter, 10-15 mm long, appressed-strigose; persistent style that forms slender beak 1.5-2.5 mm long. Seeds yellow to red-brown, reniform, about 3 mm long, smooth. Ecology: Weedy species on sandy, gravelly, or clayey soils on flats and along margins of washes from 4,000-6,000 ft (1219-1829 m); flowers June-October. 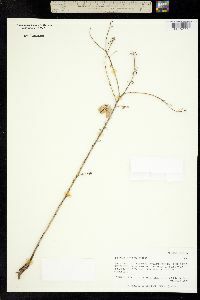 Distribution: AZ, sw NM, sw TX, s OK and in FL; south through the Greater Antilles, MEX, C. and S. Amer.. Notes: An erect-ascending annual from a taproot distinguished by the trifoliate leaves glabrous above and with appressed hairs below; the flowers are yellow with the keel often constricted or rolled, extending into a beak; the sparsely, few-many-flowered inflorescence with inflated, bladder-like pods also help to make this one distinct. Varies greatly in size of the plant and of the flowers and in the number of flowers in the raceme, from 1 to many. Petals often tinged or streaked with red. Ethnobotany: Seeds boiled, or ground and eaten as a pinole. Etymology: Crotalaria is from Greek drotalon, a rattle or clapper, while pumila means dwarf.